Don’t forget excessive headspace clearance. Will cause the case neck to protrude forward against the throat and result in high pressures. A buddy of mine did this for a F-class match. Pierced primers and locked up firing pin. He had about .020″ headspace clearance when rechecking his reloads. I am also surprised that incorrect powder isn’t on this list. If that rifle / ammo combination had that much “wiggle room” what sort of excess striker protrusion was there to set them off? Cetntre-fire striker protrusions, (large rifle primer), usually run in the .040″ range, give or take a thou. Much more protrusion in a properly headspaced rifle and you run the risk of puncturing the primers, thus causing gas-cutting damage to the striker tip and the bolt-face. Number one absolutely has to be not paying very close attention to what you’re doing. Everything from getting powders confused to failing to use the right dies is a consequence. It’s pretty critical to ensure that you don’t try to save time by doing more than one thing at a time. The time you save by skipping steps will be spent in the ER. 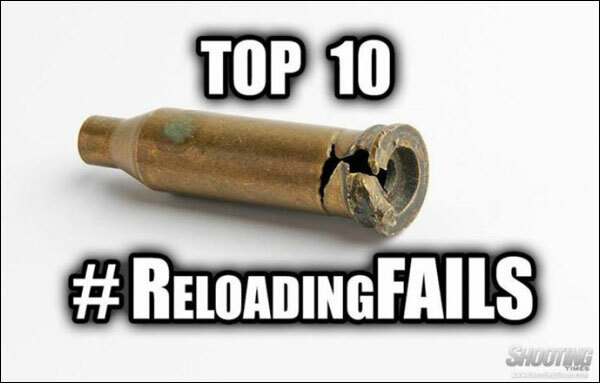 IMHO one of the top reloading mistakes is not having a clear, defined, repeatable workflow that includes checkpoints for its crucial phases. One I see a lot is switching components with out working up from the bottom again. Another question I ask , have you ever read the front section of your reloading manual and the answer is usually NO . A case with no powder – seriously scary stuff! The primer theoretically has enough pressure to lodge the bullet beyond the throat (or so I read). Very unpleasant consequences if in the heat of it all at the range or in the field you don’t recognize what happened and fire another round. I’m not to proud to admit when I started reloading I didn’t realize only one spot on my hornady progressive press was capable of depriming the case. Yes I bent the pin. Rcbs sent me a bag of pins free of charge and feel free to call with any questions. Also: Loose primer pockets that are reloaded anyway. No savings here. Disregarding incipient head separation signs and reloading the case one more time, a sophisticated version of Russian roulette. Thinking that a correct max load for a Sierra 168 grs will be safe with any 168 grainer from any brand.